This is June, pearl month, when thousands of classic strands will be given to brides, graduates and June birthdays. Suppose you have your strand, but you don't wear it much. If they have barely seen light since they came out of the oyster, rehab your pearls! This fun project need not be costly; even $75 (my estimate for new clasp and stringing) can utterly transform your necklace. Use your strand and add charms or decorative elements. 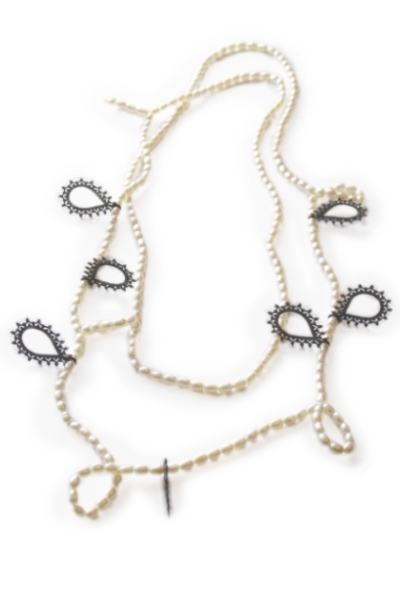 Shown, Lacy Loop Necklace by British designer and goldsmith Marianne Anderson. You can hang the elements from the strand or connect sections with them, as in another of Anderson's designs, the Scroll Necklace. Though I have not contacted her, I have found that most designers and goldsmiths will work with your material to renovate a piece. If your strand is classic white, a skilled designer can select pearls to compliment your pearls' body colour and overtones. Here's a mixed strand from Zara Scoville of Priceless Imperfection. She could add some fab keshis or Tahitians, and I want to see those! You might have other necklaces to donate to the project, or you could buy some stones. 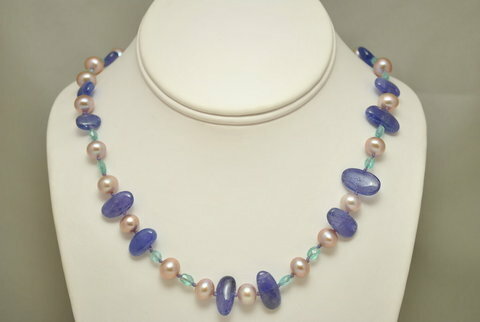 Example: Kojima Company pearl, tanzanite and apetite necklace. An inexpensive option: mix pearls and glass nugget beads. A good local bead store sells semiprecious beads and can do the stringing; take a photo or sketch to discuss what you want. 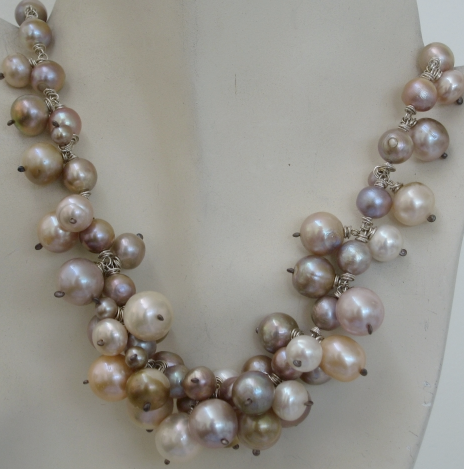 Stringing white pearls on dark silk (charcoal, taupe) or lighter (pink, olive) is a fun way to reno for very little. I'd also change the clasp to something informal. You can also use tiny pearls as "knots" between your pearls; shown, Kojima Company Petal Pearl necklace; white pearls with tiny purple-black rice pearls. A good solution if the pearls are tight as a necklace. 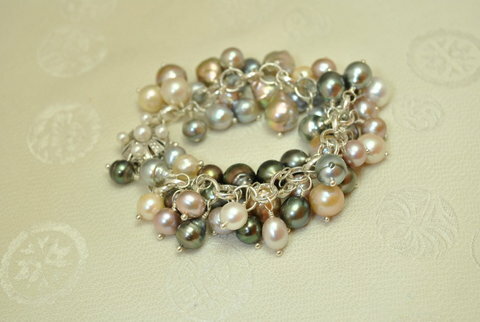 Make a double-strand bracelet or add more pearl variety to make a lavish piece. 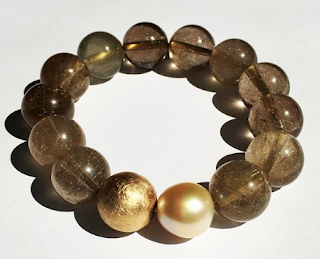 Shown, Pearl Soireé bracelet from Kojima Company. Now that you ar e a glorious mature woman, your pearls may need to grow too. 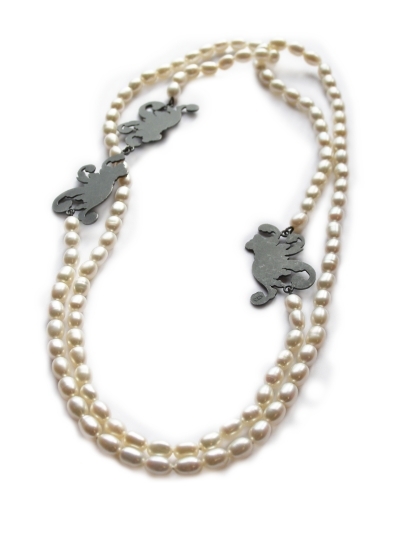 Sticking a pendant on too-short pearls only emphasizes their skimpiness, like belting a tight dress. Lengthen the strand first by adding other material to get the right length and mood. 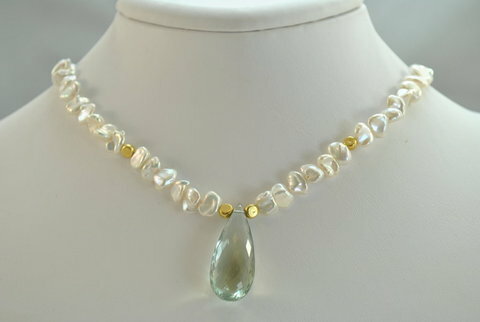 Shown, a necklace by Kojima Company: white keshis (classic Akoyas would also look pretty) lengthened by adding 18k gold spacer beads, with a green amethyst briolette. It's pearl month! Wear your pearls, grateful for the gifts of nature, especially the lustrous, wondrous sea gem. 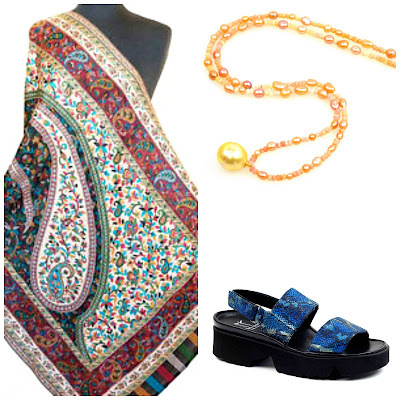 You present many ways to renew a pearl necklace. Had I more than one, I might consider changing the lock to something special, unusual. I´m sure that many women are unaware about all these possibilities presented. Oh, Duchesse... you are too good to us! So many ideas, so beautifully illustrated with these photos. Thanks. My strand of wedding pearls is rarely worn. They need to be restrung at the very least, but the ideas you shared in this post have helped me look at the possibilities beyond mere restringing. Thanks so much! I'm an infrequent commenter but this subject intrigues me. I have a total of 36" of ~8mm cultured pearls that I bought back when pearls were expensive (in my case, 1994) and I've always loved them, but I never wear them anymore. They are currently strung on two 18" strands. The double strand bit seems a bit ladylike and fiddly to me now that I'm 45. And the 8mm seems small - I tend to wear chunkier jewelry now. I hadn't thought of trying to refashion them. I'm afraid of stringing them with other stones because I wouldn't want them to rub. How would you seek out a reputable jeweler to give advice in this regard? I have a jeweler I like that did an interesting thing with my wedding/engagement ring, who also made a custom ring for a friend, but he seems like more of a metalsmith. Duchesse don't disappear on us we need you!! My friend cleverly pinned a brooch to the side of her pearls and it looked brilliant. Thanks for your question. Since you think 8mm is too small, you are a candidate for a pearl-mix necklace or a multistrand bracelet, where 8mm does not look small at all. Because I doubt your two strands match perfectly in colour and overtone, the only way to use all of them in one piece is to blend them in with other pearls. If you use keshis, off-rounds, coins etc this will not be expensive. You could also mix with stones; your pearls will not be rubbed b/c there are knots between the pearls and stones. If the jeweler uses spacer beads (instead of knots)the beads will rub the pearls over time, but only where they touch, and if the reno is permanent, you will not see that. But- wear them, dear rb!!! I'd contactSarah Canizzaro at Kojima; Sarah and her team can go from conservative to funky depending on what you like. Look at pieces on their site for ideas. 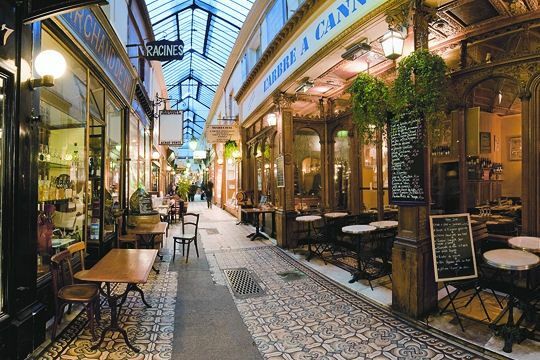 Or if you know a good designer (a good merchant is not always a good designer)take him or her a picture. If you like Zara Scoville's funky wire-wrapped pearls, contact her- knowing this is the technique she uses and your pearls will be merged with some of hers. Tracie: Restringing is the perfect opportunity to add a new clasp and I'm going to guess the clasp that was lovely with your gown would be rather conservative now. 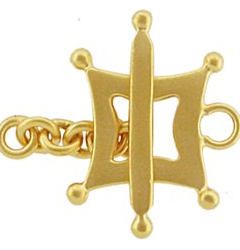 Nina Designs has some marvelous clasps; pay attention to size. LPC: Why? Have I given cause for alarm? Cybill: Hi, honeybunch. It's a great look but I don't recommend it as it will scratch your pearls. Fine for costume but repair to an abraded pearl can only be done if the nacre is good and thick and the pearl specialist will tell you, "At your risk". I love these ideas! I have a graduated strand that belonged to my grandmother; they're too small and ladylike for me, but maybe I can mix them up a bit. I have an image of some "bunch of grapes" type clumps on a chain. Pseu: Bunch of grapes style is very modern. Old pearls very often 'barrel' with wear and some will yellow. If neither has happened, you can definitely cluster them and I'd mix in some other pearls or stones. If the pearls look antique consider layering with a chain (at this piont why worry about abrasion) or other necklaces. I inherited a 36" strand of my mothers, that had barreled. Instead of reno-ing, I gave them to a younger (but still past 70) friend of hers, who cherished them. I don't know whether you saw this article yet about Keshi pearls. I thought that you might find it interesting. Belle: Thanks! I've been hearing about this for awhile. So strange to me; when I first started buying keshis were practically throw-aways! Recently saw a strand of Tahitian keshis at Birk's for $25K. They were exquisitely matched and lustrous, but still, astonishing price. good information and details! Thanks for posting!